Reading the news, you might well conclude that the 2010s are the decade of cheating. Dozens of runners allegedly broke the eligibility rules to enter the 2015 Boston Marathon. In 2012, 125 of the students in a Harvard University government class— with 279 students total— were accused of cheating, and 70 were eventually forced to withdraw from Harvard altogether. In 2015, the hacking of Ashley Madison’s website (“Life is short. Have an affair”) uncovered 37 million users worldwide. The sheer volume of these cases is enough to make us despair about human character— even if we didn’t have ample evidence from our own, more or less spectacular, moments of dishonesty. Maybe we are all, deep down, just dishonest people. But we don’t just have to speculate. We live in the age of social psychology, where researchers can actually investigate our hunches about the prevalence of dishonesty. But surprisingly, the same researchers who have confirmed our worst suspicions— people are very prone to cheat— have also discovered something less expected. 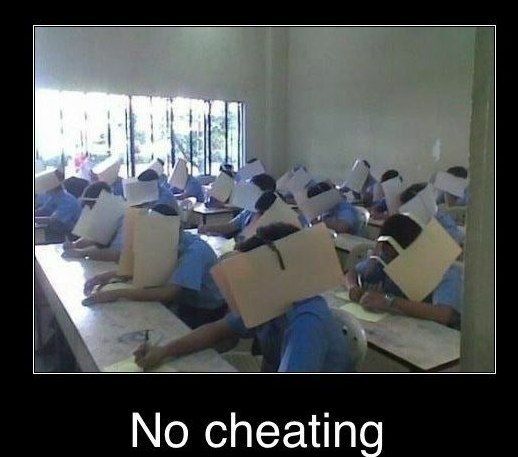 They’ve found a way to practically eliminate cheating altogether. First the bad news. Athletes and celebrities are not alone. In fact, most people will cheat if given the chance. A London Business School study had people in a control group take a test with 20 problems. When the time was up, the test was graded by the experimenters, and each participant was paid $0.50 per correct answer. On average they solved eight problems correctly. Another group took the same test, and also knew that they would get paid $0.50 per correct answer. But here was the twist: They were told to grade their own tests and shred their answer keys when they were done— meaning they could report whatever number of correct answers they wanted and get paid accordingly, with no questions asked. What happened? They “solved” thirteen problems correctly. Could it be that this second group was just that much better at problem solving? It could be. But I think we all know what really happened. So far, this sounds like more of the same depressing news about dishonesty. But researchers at the University of Toronto had a really clever idea about how to expand this experiment. Their control group averaged 3.1 problems solved (these were clearly harder problems). Then there was the “shredder” group. For this group, confirming the earlier experiment, the number of problems “solved” went up, to 4.2 on average. This is encouraging news. Most of us are not entirely dishonest people after all. Truly dishonest people would not care about the Ten Commandments, nor would they care about seeing themselves as honest and let that regulate how much they actually cheat. But for most of us, our view of our own characters matters. We want to think of ourselves as good— and honest— people. This discovery has a number of important practical applications. One is for education. Cheating is a huge problem in high schools and colleges today. According to one study, the average rate of cheating while in college is a whopping 86 percent. But a school’s honor code, if it is taken seriously and used for every paper and test, can serve a similar function as the Ten Commandments. In fact, the same researchers at Toronto showed this experimentally. Control participants averaged 3.4 correct answers. When given an opportunity to cheat with the shredder, those participants usually did (6.1 correct answers). But when they first signed an honor code, cheating disappeared (3.1 correct answers). Strikingly, this was true whether they would be paid $.50 per correct answer, or even $2— four times as much. The key, though, is that students actually sign the code. It can’t just be a nebulous commitment of the school. It has to be something they are personally committing themselves to. Another practical application has to do with cheating on financial paperwork, whether taxes or a company reimbursement form. Such cheating probably results in billions of dollars in losses each year. Normally the place where you sign your name and pledge that you have completed it honestly comes at the very bottom. The London Business School researchers found that 79 percent of participants in their study who signed on the bottom of a tax form misreported their earnings. But when they moved the moral reminder to the top of the form, the percentage of participants misreporting shrank to 37 percent. Or consider cheating in relationships. My wedding ring serves as a daily reminder of the moral commitment I have made to my wife— a reminder to me and to others. Christians, of all people, should not be at all surprised by the prevalence of cheating in these experiments (or in society more generally). Indeed, we could have predicted ahead of time just what the psychologists would end up discovering: Most of us want to cheat but we also want to think of ourselves as good people. These are exactly the kind of psychological contortions you’d expect of sinful people. But because we ourselves are sinful people, we shouldn’t discount our need for mirrors to our souls—both our temptations and our aspirations. And as it turns out, literal mirrors might work best of all. In another study, when psychologists asked participants to take a test in an empty room for five minutes and then stop when an alarm bell goes off, 71 percent kept going well after five minutes. But when the participants were seated at a desk with a mirror facing them on the wall, only 7 percent went past five minutes. A stunning difference. We all need mirrors like that— literal or metaphorical. It might be wearing a cross around one’s neck. It might be a special bracelet or ring. It might be a verse that one carries in a pocket or has taped to the office wall. It could be the simple presence of a Bible in plain sight next to the tax forms or the computer with unfiltered Internet access. Thinking that we can get by and not cheat by depending on the goodness of our characters or the strength of our willpower is foolish. We need all the moral help we can get. In matters of morals, people need to be reminded more often than they need to be instructed. Deuteronomy 6:4-9 — Hear, O Israel: The Lord our God, the Lord is one. Love the Lord your God with all your heart and with all your soul and with all your strength. These commandments that I give you today are to be on your hearts. Impress them on your children. Talk about them when you sit at home and when you walk along the road, when you lie down and when you get up. Tie them as symbols on your hands and bind them on your foreheads. Write them on the door-frames of your houses and on your gates. Set our hearts on fire with love to thee, O Christ, that in its flame we may love thee with all our heart, with all our mind, with all our soul, and with all our strength, and our neighbors as ourselves; so that, keeping thy commandments, we may glorify thee, the giver of all good gifts. Amen. This entry was tagged commandments, obedience. Bookmark the permalink.